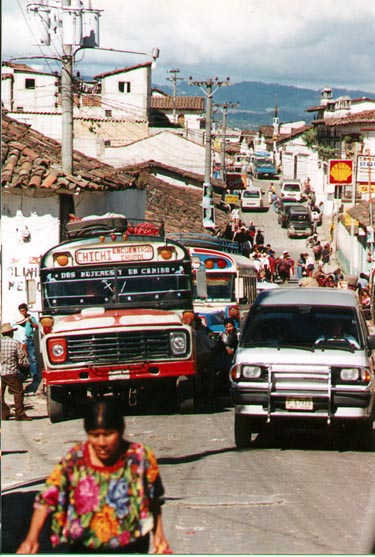 Our journey to the western highlands will take us to the most densely inhabited part of Guatemala, and the home of most of the Indian population. Stretching from Guatemala City to the border of Mexico, we see the great mountain peaks of the Sierra Madre and the Cuchumatanes range, and temperate and near-tropical valleys. Guatemala's chain of volcanoes run parallel to the Pacific, forming the southern rim of the region.. 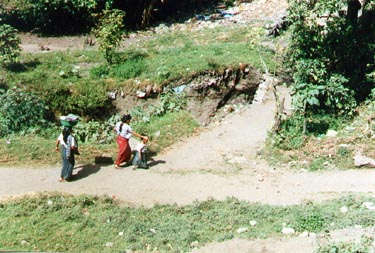 Roads climb to frosty heights, drop down in a few kilometers to plateaus planted with corn and wheat, and plunge into narrow valleys, their sides, carpeted with trees, streams rushing through at the bottom. 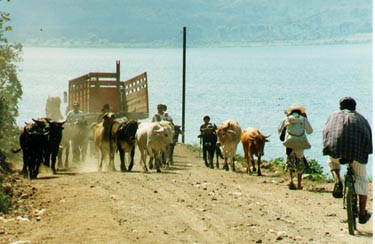 Spotted here and there through the landscape are clusters of whitewashed adobe houses with red tiled roofs, little hamlets of people dressed all alike in traditional clothing. 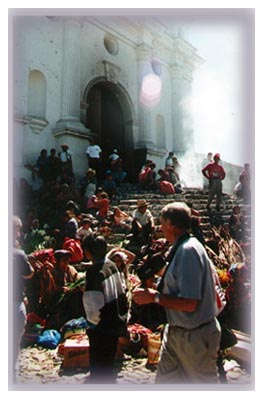 The Church of Santo Tomas, in Chichicastenango, was built around 1540. 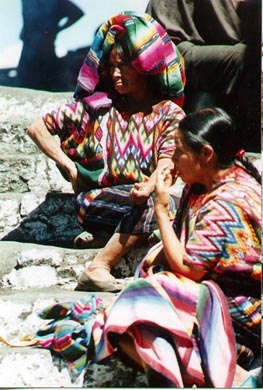 These women, dressed in traditional clothing, sit on the steps leading to the church, where incense is burned to honor the guardian spirits of the church. 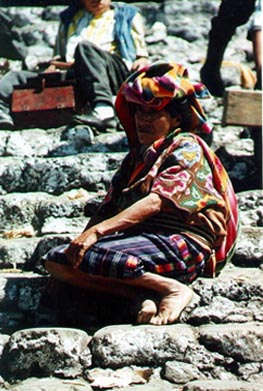 An interesting combination of old Mayan traditions, and relatively new Catholicism, is evident here.